A highly classified PF government security document has linked Post newspaper owner Fred Mmembe to supporting and sponsoring some of the uprising groups in Western province that want to secede from the rest of Zambia. The document has also linked Mr. Mmembe to the formation of the PF parallel structure to be led by Justice Minister Wynter Kabimba, Tourism Minister Silvia Masebo, Commerce Minister Emmanuel Chenda, Lusaka Province PF provincial Chairperson Geoffrey Chuumbwe among others. According to the security document, Mmembe has been sponsoring those groups in Barotseland as a bait to get what he wants, which is the de-fecto presidency of Zambia through either Mr. Kabimba or his auntie Ms. Inonge Wina. According to the well-articulated document, which could either have been authored by the Zambia Intelligence Security Services or the PF parallel Intelligence unit headed by former Director of Intelligence, Xavier Chungu whose Permanent Secretary is Kaiza Zulu based at State House, Mmembe has never been happy with Mr. Sata. The document alleges that from the word go, Mmembe had hoped that his auntie, Inonge Wina was going to be appointed republican vice-president, a position currently held by Guy Scott, who does not even qualify for presidency due to parentage clauses in the Zambian constitution. Mmembe grew-up in late Arthur Wina, the husband to Inonge’s home, in Western province and the mother still resides there. M’embe’s mother lives in Mongu where he has built him a mansion and bought her a ‘Hammer’ but the old woman does not even know how to drive. He considers himself the most powerful person in Zambia who can decide who becomes the Zambian president and even who he sends to jail among the key people in Zambia. So far at party level, Kabimba has successful managed to completely sideline his deputy secretary general Bridget Attanga in preference to his appointed officials such as Situla Sikwindi who is political secretary in the office of the secretary general as part of the parallel PF structure. Sikwindi and others are the ones Kabimba sends to all local and international foras to represent the party and government instead of the deputy secretary general Ms. Attanga. The document alleges that Mmembe has so far not come out in the open to cover or condemn the uprising groups in Western province because he sponsors and encourages them with a view to use them as a bait to the ailing dictator president Michael Sata so that he gets what he wants, mainly the de-facto presidency of Zambia. According to the document, Mmembe wants to appear at some stage as the chief mediator between the Barotse uprising groups and Mr. Sata’s government with conditions such as being given more powers, including the vice-presidency which may lead to the presidency once Mr. Sata leaves before or in 2016. With common knowledge that ailing dictator Mr. Sata may relinquish power before or in 2016, there has so far been open battle for succession in the PF between Defense Minister Geoffrey Mwamba and Justice Minister Wynter Kabimba who is sponsored by Mmembe that has seen their cadres violently clash and destroy government property. Among the wide-ranging recommendations in the document are to slowly cripple Mmembe’s wings from PF government by among others frustrating, removing, demoting, and transferring some key government officials that are linked to the Post newspaper. So far, Information and Broadcasting Permanent Secretary Amos Malupenga, who was Fred Mmembe’s blue-eyed boy, has been sent into frustration through a demotion as PS for the volatile region of Western province. 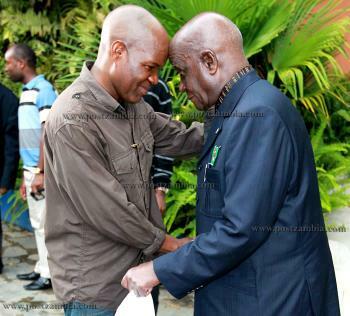 Malupenga was also very easy to dump because he was involved in massive corrupt deals involving digital migration and the Hologram projects that is likely send majority of the youths into further destitution as they were surviving selling pirated musical CDs and DVDs in the streets. The Watchdog is so far still studying the more than 17-paged security document with its annexes.